I have a baby loom too ! I enjoy it very much and am working to learn Pick up stick patterns ( you can indeed use pick up sticks with this little Brio loom. Its a bit tough to do at first since the rigid heddle (newer model) which is factory set makes a rather poor shed in the up position. but it can be done. I love this little loom. but will switch to a larger table loom some time in the future will pass this on to someone who might enjoy it then. I’d love to see your pick-up! 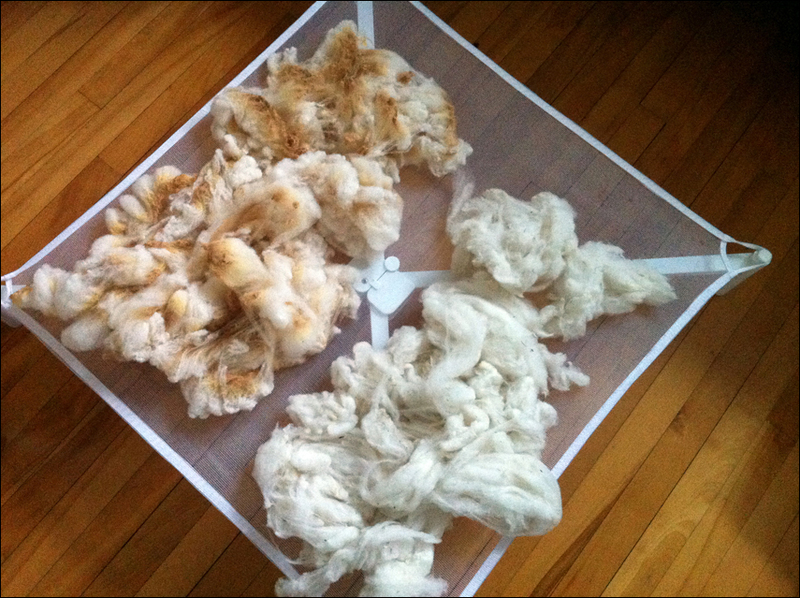 I’ve been thinking of trying a little needle-woven tapestry, in which case the shed would be of less importance. I find it hard to hold the shed in the up position too, and have gotten into the habit of holding the lever with one hand and passing the shuttle with the other. P.s. I use warp sticks which i cut myself from lumber known as ” screen molding “found at my local Home Depot then cut to the size of the warp bars and sanded smooth for better working and less pulling of the warp yarn/ cotton string. this allows me to keep the warp even tighter all the way through the piece to the end. That’s a good idea! I’ve been using bamboo knitting needles, which are a bit slippery for that purpose, so I’ll give the molding a try. 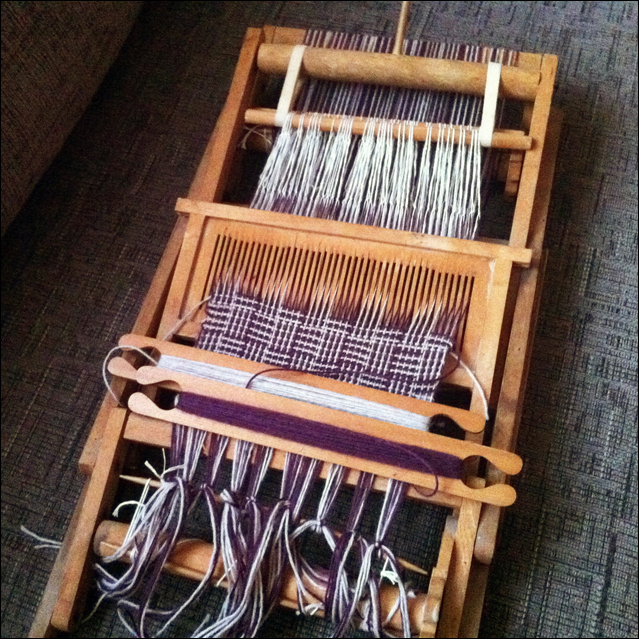 It’s so nice to hear from someone else using this loom! 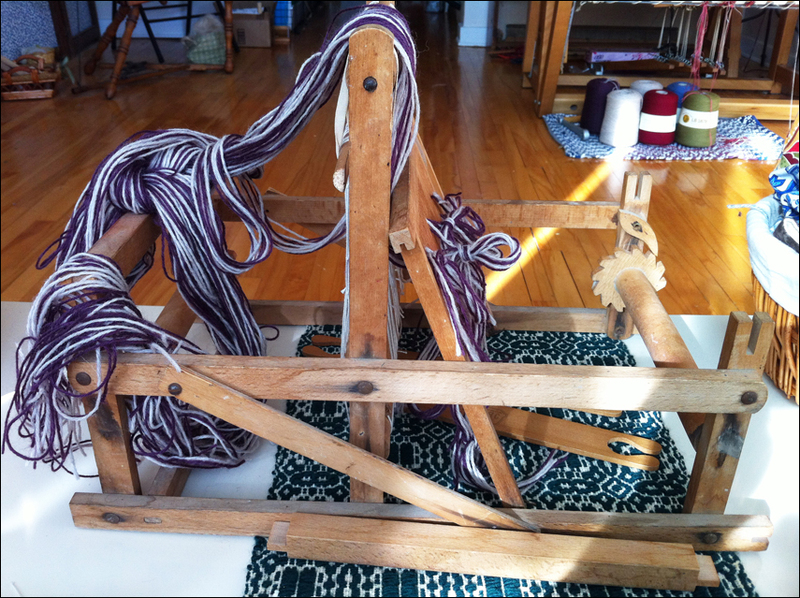 What kind of weaving are you able to do on the rigid-heddle version? For mine, I found a lightweight wool yarn (Lion Brand 1878) that makes a nice drapey fabric sleyed two to the dent in my old wooden reed. 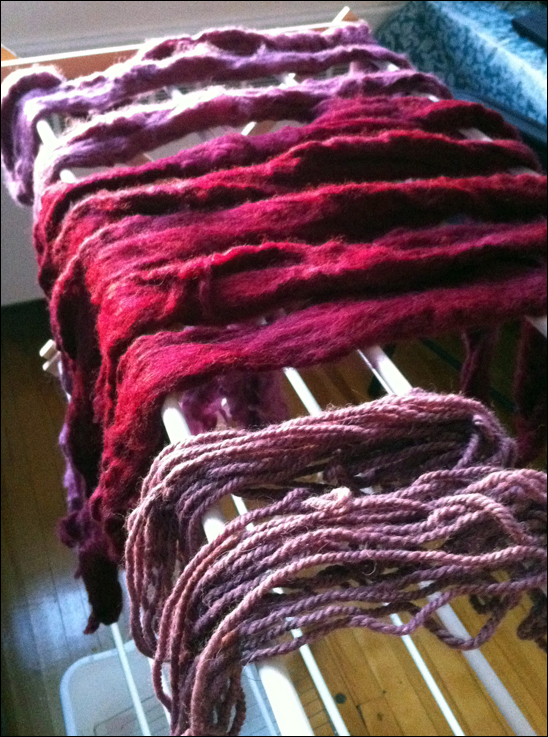 Bulkier yarns kept sticking in the reed while still sett too loose. First of all my Pick up stick (weaving sword) is home made from salvage wood from an old painters easel I took apart years ago…about 15 or so inches long that I wittled down so it has dull point at both ends. (was actually fun to do but i nearly severed a finger ((well not really but I did get a nasty cut )) when my exacto blade sliped. ) hint : use the proper tools to do wood carving. Lesson learned here. I am going to try a thicker cotton warp the next time as of now I’m using a light cross stich type floss cotton as the warp and not to heavy yarn to weave with. If you don’t mind not using the knitting needles for anything else try sanding them to make them a bit less slick. but my screen molding warp sticks are flatened on one side and a bit rounded on the other they hold pretty well after a good sanding. I’m still in the very experimental stages of pattern weaving … so when I come up with a piece that comes up to my standards…not very high as of yet … I will send you a picture of it. I’m having such fun trying though !!! May I suggest you get some extra fine sand paper ..wrap a thin flat stick…( wooden ruler maybe) to sand the inside of your wooden reed? inside each dent so that they are a bit more smooth ? the newer model also has a wooded reed. Thanks for spending the time to get back to me… I am enjoying our posts to each other .